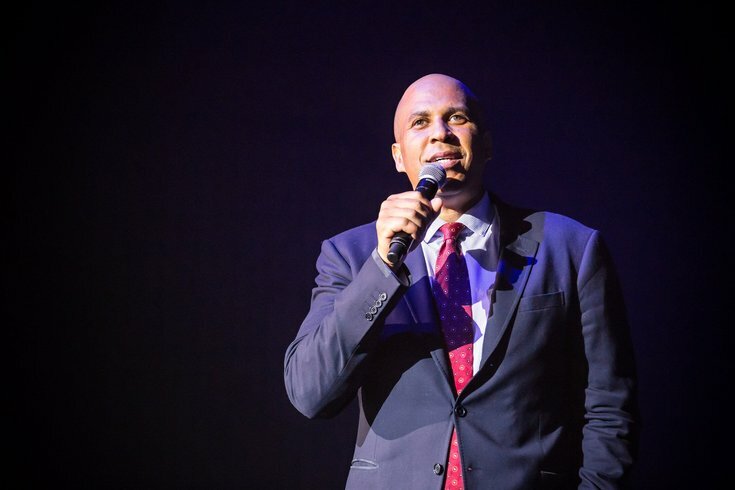 Sen. Cory Booker speaks at the Camden Rising concert at the BB&T Pavilion in 2016. U.S. Sen. Cory Booker defended former New Jersey Gov. Chris Christie during an appearance on Jimmy Kimmel Live on Thursday night, and had a message for anyone who supports partisanship in American politics: don’t. Booker, a Democrat, said during his five years in the Senate he has tried to reach across the aisle and meet his Republican counterparts — he’s even gone out to dinner with Republican Sen. Ted Cruz (which was trending on social media instantaneously, by the way). Then Booker went on to tell “the tale of two hugs,” he said. This starts around 3:32 in the clip. The first hug he’s talking about is in July 2017 when Arizona Sen. John McCain was diagnosed with a brain cancer called glioblastoma. Booker hugged McCain on the Senate floor and was met by enormous criticism from Democrats. “You are literally choking up as he is walking through his career, and it strips away his partisanship and you began to see the public servant,” Booker said. “I get home that night and I’m getting beat up on Twitter and on my side of the aisle for, ‘How could you hug that person?’” he added. It reminded him, he said, of the second hug in question. That one took place in 2012 between Christie and President Obama in the aftermath of Hurricane Sandy and Christie was taunted by his political opponents for it during the 2016 Republican presidential primaries. “Have we gotten to the point in America when we are vilifying fellow Americans that even human contact with each other is considered a betrayal of your tribe or your party or your group?” Booker said. Booker, formerly the mayor of Newark, New Jersey, had to work with Christie routinely during the Republican's two terms as governor. “I could write a dissertation on my disagreements [with Christie] but he and I would get together and say, ‘Hey look, we disagree on all of these things, where do we agree? Let’s find some common ground and build from there,’” Booker said. On the matter of Donald Trump, Booker said he will “never ever hate” the president. Even though Donald Trump hilariously tweet-mocked Booker back in 2016. “I don’t want you to be my president, but I will never let your mean words pull me so low as to hate you,” Booker said. Rumors have been circulating that Booker will run for the White House in 2020.